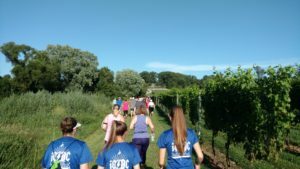 Check out Jennifer’s review of the the 2015 Boordy Vineyard 5k! 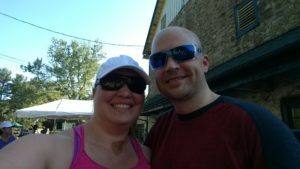 After my husband and I ran this race in 2015 I told myself that the next time we did it we would take better advantage of the event: pack chairs and blankets to sit out on the lawn to listen to the band, bring a picnic dinner, and take the following day off of work so we could stay out late drinking wine. Unfortunately, things came up in the months between when we signed up for the 2016 race and the actual event and we weren’t able to participate as I’d hoped. But it’s still a fun race with free wine at the end so although we’d have to be up early the next day we wanted to do it. 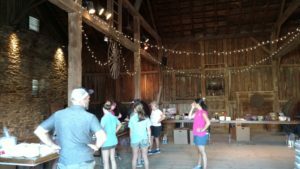 The Baltimore area had been experiencing ridiculously hot temperatures and humidity all summer, and the night of this race was no different. At the time the race started (6 PM), the temperature was 94 and “felt like” 104. I don’t do well in heat and I knew I would struggle, but my husband and I decided to stick together and do very conservative intervals until one of us decided that we needed to walk. Once again we decided to pick up our bibs and shirts the day of the race. The organizers had a table set up about an hour before the race so we just got there a bit early. They also had pick-ups in local Charm City Run stores in the week before the race but I had been traveling and couldn’t make any of those times. 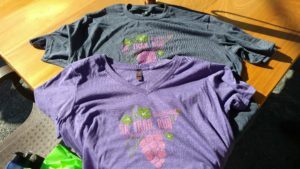 All runners received a gender-specific cotton-feel tech shirt: women got purple and men got grey. I liked the shirt and found it comfortable. 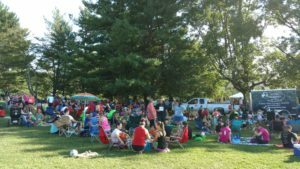 I think it’s pretty good quality for a 5K event. I ended up wearing a similar outfit to what I wore for the 2015 race. 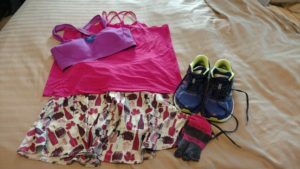 It was comfortable and wine themed, so I just went with it again: WineALittle Sparkle Skirt, pink Nike tank top, purple Adidas sports bra, Injinji socks, New Balance 860v6 shoes with custom orthotics, Garmin Forerunner 620 and Gymboss interval timer, and Nathan handheld water bottle. I forgot to bring a Bondi Band and knew the sweat would be problematic so I purchased a white Nike hat at a small Charm City Run booth before the race. Other than picking up our bibs and shirts we laid pretty low during the pre-race. The band was already playing and they do pretty good covers so we found a ledge in the shade to sit on and listened to them. 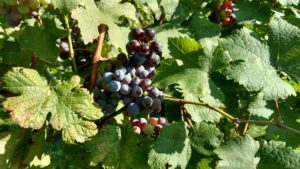 The course is an out-and-back that starts in Boordy Vineyard, winds around one of their fields, and then follows the road along Boordy and some other farms and houses. There is little shade along the course and some rolling hills. In theory it’s not that difficult or imaginative of a course, but I like the scenery and the wine at the end. The heat and humidity really did me in this time. I could only run the first 1.5-2 miles and then had to drop to a walk. And I wasn’t alone—a lot of people had to walk it. This race doesn’t give medals. Once again we got wine glasses for some free post-race wine tastings. There were seven wines to choose from that showcase some of Boordy’s most popular wines and some of their new items. Medals certainly don’t taste this good! I was in kind of bad shape due to the heat. In fact, one of the volunteers manning the fruit and cheese post-race refreshments (Boordy still ranks as one of my favorites for post-race food) asked me if I was doing OK (probably because my face was redder than a tomato and my legs were a little shaky). So I got some snacks and found a place to sit down in the shade. 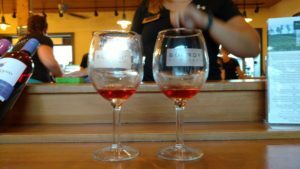 With some sugar, carbs, and water, after about 45 minutes I was feeling better and we took advantage of the wine tasting. We also enjoyed some local ice cream and organic fruit ice pops (both of which were perfect for beating the crazy heat). Since Jake had to get up for work the next day we left early. This ended up being lucky because about 15 minutes later the sky darkened and a bad storm moved into the area. So even if we’d wanted to hang around, Mother Nature would have changed our plans for us. I didn’t bring my iPod since the live band was playing great covers from the moment we arrived until we left. Sometime I really want to do this race right. This year wasn’t the year. Maybe next year will be our year. 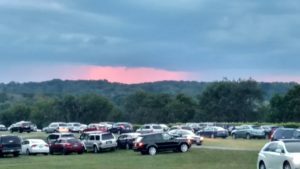 Don’t forget to go back & read Jennifer’s review of the the 2015 Boordy Vineyard 5k!